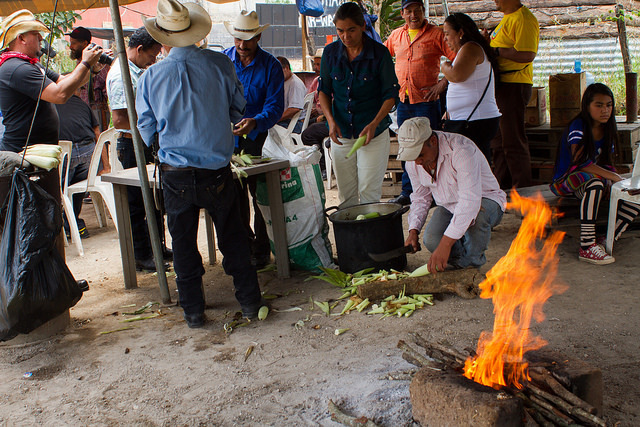 GUATEMALA CITY, May 4 2018 (IPS) - Rosa Dávila is busy cooking ears of corn, to be eaten by the men and women who have set up a checkpoint on the side of the road to block the passage of supplies sent to a mining company that operates in the area. The San Rafael mining company, a subsidiary of the Canadian company Tahoe Resources, is located on the outskirts of San Rafael Las Flores, a town 96 km southeast of Guatemala City, in the department of Santa Rosa. The roadblock has been mounted by the inhabitants of Casillas, a neighbouring rural municipality, located a few kilometres down the road, and which cannot be avoided on the way to the mine. Other transit points have also been blocked by the “resistance”, as the anti-mining protesters refer to themselves. “The first thing we want, for God’s sake, is for them to go back to their country,” said Dávila, a 48-year-old homemaker and mother of seven, as she stoked the fire. The residents of this and other neighbouring municipalities are firmly opposed to the company’s mining operations, due to the social and environmental damage they say has been caused since they began in 2007. Conflicts like this have broken out in other areas of Guatemala and in other Central American countries, not only with mining companies but also with hydroelectric power companies. “It’s not fair, and the worst thing is that they never asked us if we wanted these companies to come here,” Dávila told IPS while moving about in the kitchen set up in an improvised camp, which IPS visited on Apr. 29. The lack of prior consultations with the communities where such projects are installed is a recurrent problem in the countries of Central America, whose governments fail to comply with international regulations that call for prior consultation over whether or not the population approves of these investments. In late April, environmental organisations held in the Guatemalan capital the Second Regional Meeting of the Central American Alliance against Mining, which concluded with the requirement that the governments of the region comply with international and regional obligations to guarantee the right to free, prior and informed consultation. “We call upon Central American governments to reflect on the viability of what they call development, when we know that the extractive industry is a model of destruction and death for our countries,” explained Julio González, of the Guatemalan environmental organisation MadreSelva, at the end of the meeting, on Apr. 27. That organisation and the other participants in the meeting have joined forces in the regional Alliance against mining, in order to constitute a block with more power in the face of the activities of the extractive industries in Central America. One of the rules under which the organisation operates is ILO Convention 169 on Indigenous and Tribal Peoples, in force since September 1991, which has been ratified by 22 countries, including all countries in Central America except El Salvador and Panama. Article 6 of the Convention establishes that governments shall “consult the peoples concerned, through appropriate procedures (…) whenever consideration is being given to legislative or administrative measures which may affect them directly,” such as when a national or municipal state institution grants a concession to international consortiums. But that is basically dead letter in the Central American countries that have ratified it, said activists consulted by IPS during the meeting. The governments have not promoted consultations, because they believe that important development projects would be halted, so it is the affected communities that have carried out their own consultations, they added. In Guatemala, where 63 percent of the population is indigenous, around 90 such consultations have been held, by show of hands. “Before the hydroelectric companies were to arrive, we began to carry out consultations, and we asked whether these businesses have the right to take our rivers, and the vast majority said no,” 69-year-old Mayan Indian Cirilo Acabal Osorio told IPS. So far they have managed to stop attempts by companies to install projects in the eight communities putting up resistance in that region, which are predominantly Mayan, said the native of Zona Reina, municipality of Uspatán, in the department of Quiche in northwestern Guatemala. In Honduras more than 40 open town meetings have been held in which the population of different localities has rejected similar projects, said Pedro Landa, of the Reflection, Research and Communication Team (ERIC), attached to the Jesuits. “But the State continues to ignore the will of the people,” he said. Environmentalist activists said local governments in the area consider the consultation processes to be non-binding, and as a result do not take them into account. 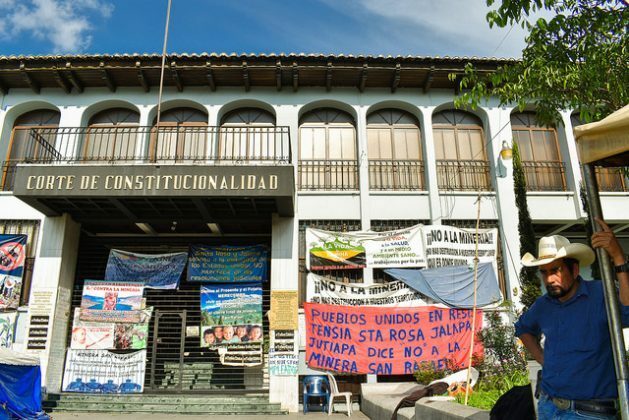 Before the Salvadoran legislature approved, in March 2017, a historic law prohibiting metal mining in all its forms, civil society organisations carried out popular consultations in at least four municipalities, under the Municipal Code. For now there is no need for further consultations, as the law banned mining company investments. But the spectre of mining is still present after the right-wing parties, its natural allies, obtained an overwhelming majority in the Legislative Assembly in the Mar. 4 elections, warned Rodolfo Calles, of the Association for the Development of El Salvador (CRIPDES). Convention 169 refers only to indigenous peoples, although the experts said in the meeting that national laws that serve the same purpose can be applied: people affected by any industrial activity must be informed and consulted beforehand. “In the case of countries that do not have indigenous communities, they will use other mechanisms that they undoubtedly have, such as referendums,” Sonia Gutiérrez, an expert with the Association of Mayan Lawyers and Notaries of Guatemala, told IPS. The extractive industry has no economic weight in the region, despite its impacts on the environment and on production in the communities where it operates, Nicaraguan activist Olman Onel told IPS. He pointed out that in his country, for example, it only contributes one percent of GDP and 0.66 percent of employment. On the other hand, the participants in the forum denounced the police and judicial persecution suffered by environmentalists in the whole region, as a mechanism to silence opposition to such projects. Landa, of ERIC, said that in Honduras, where more than 800 extractive projects and 143 hydroelectric projects have been approved in recent years, at least 127 environmentalists have been killed, including Berta Cáceres. She was riddled by bullets on Mar. 3, 2016, for her fierce opposition to the construction of the Agua Zarca hydroelectric dam, located between the departments of Santa Bárbara and Intibucá, in the northwest of the country. Meanwhile, in San Rafael Las Flores, local inhabitants have organised to defend their land and their livelihood, agriculture, although the damage caused by the extractive activity is already evident, they said. Rudy Pivaral, a 62-year-old farmer, told IPS that the impacts on the flora and fauna are already being felt, and there is a decrease and drying up of water sources, which makes it impossible to continue producing two or three harvests a year, in addition to the health problems associated with water pollution. Around 96 families in the village of La Cuchilla, on a hill next to the site, had to be evicted because of damage to the walls of the houses, due to the vibrations produced by the drilling in the ground.